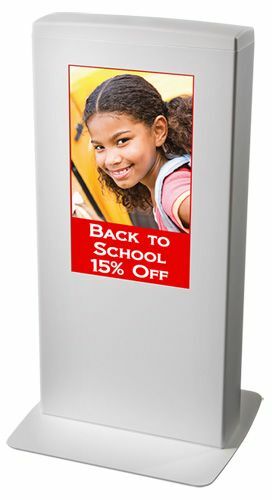 BrightSign LLC® has announced a significant price reduction on its flagship tabletop signage display, the BrightSign TD1012. Introduced last year, the freestanding, portable display is a reliable, solid-state solution for customers seeking to make an impact at the point-of-purchase. The TD1012 features an attractive yet durable steel enclosure with a built-in portrait 12.1" high-resolution screen and solid-state media player. With a replaceable/rechargeable battery offering at least 12 hours of battery life and wireless networking built-in, this display can be placed where signage is most needed such as retail merchandise tables and check-out counters. Improvements in the manufacturing process and decreased production costs have allowed BrightSign to offer this portable tabletop display tower at a fraction of the original $1999 price. The TD1012 is now available for only $1299. The BrightSign TD1012 is a PC-less digital signage solution. The free BrightAuthor PC software allows users to build playlists quickly and easily. Content updates can be done remotely via Wi-Fi (802.11a/b/g/n) using the BrightSign Network or Simple Networking; or using USB or SD cards.